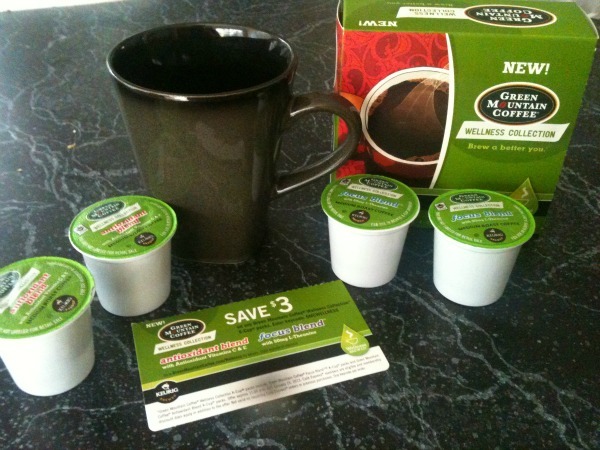 Green Mountain Coffee New Wellness Brewed | More Crunchy Beach Mama! Introducing a new line from Green Mountain Coffee ~ The Wellness Collection. Who said that coffee wasn’t good for you? I was thrilled to find this different twist in my morning cup of coffee. The Antioxidant Blend is 10% Daily Value of Antioxidant Vitamins C and E per 8 fl. oz serving. Vitamins in my coffee? oh yeah! Sometimes I’ll drink a cup later in the day if I just need it. Yes, it makes me feel better. The Focus Blend is perfect for that ~ a rich, well-balanced brew with 50mg of L-Theanine in every 8 fl. oz. serving. They are both made from Fair Trade Coffee! The Wellness Collection is only available online right now. Use code GMCWELLNESS for $3 off a pack. I received product samples from BzzAgent to share this new line with you.